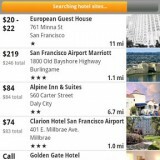 Lots of features, searches travel deals from top booking sites. Easy itinerary import. Not as much flight and travel information as some airline and other related apps provide. This is understandable and keeps the app lightweight and easy to use. This app has many travel features and information, but its primary purpose is for searching and booking flights, hotels, cars. 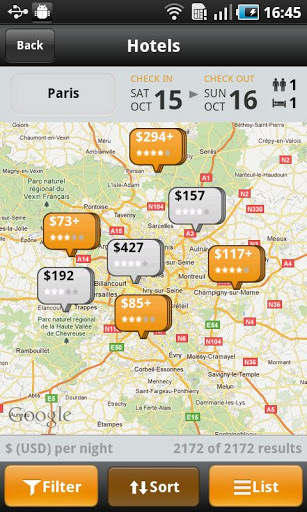 Kayak can book travel services such as Travelocity, Expedia, Hertz, Avis and others directly, allowing you to create a complete itinerary of the best deals online all under one app. To get the best prices you no longer have to search several travel sites or pay separately for hotels, cars and flights. When you reach your destination, you can also search for hotels and other services in your vicinity via GPS. Kayak’s popularity has grown so much in the past few years that Princeline.com acquired the app a few months ago for 1.8 billion US dollars. That’s right, almost 2 billion with a ‘B’ dollars. Apart from the search and booking features, Kayak allows you to track your flights, manage your trip itinerary, receive travel alerts, access airport and other useful information. You don’t have to book through Kayak to use these features; you may enter your travel details in the app or just email your itinerary to trips@kayak.com and they’ll enter the details for you. Kayak is free for Android devices. 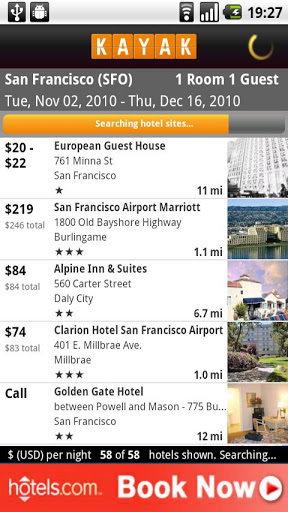 Apps that have similar features are TripIt and Worldmate. If you’re interested in these types of travel apps, I suggest you try each one to find out which works best with your preferred travel carriers and learn which app features you like best. Like Kayak, TripIt and Worldmate are free with optional paid “pro” upgrades.